A Brief Discussion of Falls Among Persons with Amputation of the Lower Extremity. 4. Judiciously decide if you need to report the fall to a professional or otherwise seek assistance (immediately, short and/or long term). There are several interventions to assist in minimizing falls. Some are relative to your environment, some deal directly with physical attributes that you can change and some deal with physical attributes that are beyond changing. Regarding the environment, look at your home or other places that you frequently visit for potential trip hazards. These might include difficult to see objects, clutter, pets and others. Obviously, some of these are simply correctable. For instance, if clutter is on the floor in a room entrance, it may simply be removed. Pets conversely, may be unpredictable. A dog may rush in front of you or jump up on you in a vulnerable position resulting in a fall and/or injury. The dilemma is loving and caring for the pet, which is proven to have positive influences on some aspects of health but also not placing yourself at risk of a needless, avoidable fall. In a case like this, you have to make decisions about when you experience low energy or otherwise vulnerable periods of the day when perhaps the pet must be prevented from accessing areas that you will be in. Many times the design of a home did not account for a given mobility impairment (e.g. amputation, wheelchairs, walkers, etc). This means that hallways, entrances, doorways and other accesses are insufficient. Insufficiencies may range from adequate lighting, slope, surface friction, width, hand railing and others. Some of these are more easily and economically correctable than others. You may need to have a problem area evaluated by someone such as a physical therapist who can provide situation dependant recommendations but in some cases a building contractor may ultimately be needed in extreme cases such as in building an access ramp into the front of a home. Other issues are much less invasive such as removing rugs that may trip you because of a difference in height or because it slips as you step onto it. Again, the key with the home or other environments is to have someone look at it with you such as a therapist or a contractor who specializes in accommodative access for persons with mobility impairments. Relative to your physical attributes, it was previously mentioned that some are changeable and others are not (or at least not as readily) An example of a changeable attribute might be that you have weak hip extensors. This could result in an inability to prevent your knee from buckling as you begin to shift your body weight on to it from the other side. In such a case, if the knee is prosthetic and lacks a stance control feature, the knee might buckle resulting in a fall. If this has happened to you or if you have been examined and told such a case applies to you then strengthening the weak muscles may very well reduce your risk of falling. You may also benefit from a different component but changing your prosthesis will not be as fruitful if you also have strength deficits such as that described here. Regarding attributes that you may not change or may have difficulty changing, other strategies may be necessary. Suppose for example that in addition to your amputation on one side, you simultaneously had an insult to your balance and your confidence with walking. It may be beneficial to consider an assistive device, such as a cane, for additional support. One final comment here on changeable attributes is that at times a seemingly small detail can make such a huge difference leading to a fall. For instance, suppose you typically wear tennis shoes most of the time. On a special occasion however, you need to get dressed up in more formal clothes and wear a shoe that has a very hard sole and a higher heel height. Suddenly, your knee feels much less stable. The fact is you are precisely correct. Even small changes in the hardness of the sole, in addition to increasing the height can affect the stability of a prosthetic knee. For example, typical men’s tennis shoes have a 3/8 inch heel whereas men’s dress shoes may have a ¾ inch heel and have a very hard sole. This small difference could undermine the stability of a prosthetic knee’s typical alignment so imagine the impact of a higher heeled shoe. Now that you are thinking about ways to prevent the fall, it is logical to consider what to do if/when the event happens. Some very basic physics and engineering principles can be employed to minimize the trauma during a fall. When something/someone falls, acceleration takes place which can magnify the force of the body mass on the ground upon impact. This acceleration results in energy production that must be absorbed. Consider which material is most likely to absorb this energy; a tile floor or human tissue. Obviously the softer material, human tissue in this case, is best suited to absorb energy. Unfortunately, when human tissue absorbs energy in excess of its design, trauma and damage result. A simple strategy for diminishing the energy from a fall employs two basic principles; 1) allowing the body to be flexible and 2) increasing the amount of time during energy absorption or deceleration. Automotive designers use “crumple zones” to accomplish this during auto collisions and the idea is similar in human falling. Reflexively, people prefer to fall forward because we can get our hands/arms in front of us. Our hands are much better suited for weight bearing than is our head or chest. Furthermore our arms have strong built in shock absorbers (muscles) and crumple zones (joints) that permit us to increase the time of deceleration and absorb the energy of the fall. The takeaway point is to make an attempt to fall forward if possible onto the arms/hands unless you have been specifically instructed in some other technique by a healthcare provider. It is important to simulate and practice this in the presence of your therapist. The practice will introduce motor memory so that the body has an idea of what to do if this event happens. In the proper dosage, the practice can also strengthen the muscles and joints of the arms/hands to minimize trauma in the event of a real fall. These ‘falling skills’ are somewhat innate but as we move into adulthood, we get away from the practice which increases our likelihood of an incorrect response and ultimately injury. After you have fallen, there are absolutely correct things to do and absolutely incorrect things to not do. Instinctively, anyone around you at that time will want to help you up. This might be fine but it might not be as well. If you fell and fractured or dislocated a joint, particularly a bone or joint in the arm/hand, an improper assist can severely increase your injury. If the legs were injured or if you have become disoriented (prior to or as a result of falling), then standing again may result in another fall and/or further injury. Typically, it is best to rest for a brief moment to assure you are reoriented. At this time you should concentrate on any new pain sensation(s) to facilitate decision making about how and if you should get up. If someone was nearby and rushes over to help, you should consider asking them to confirm new sensations with a visual inspection to reveal a gross structural deformity, that may be a fracture or dislocation, or bleeding. If you are confident there is no injury, you can consider assistance with standing. You are probably best served to roll onto the stomach, bring the feet and knees beneath the trunk and then rise with support from the onlooker. If you are alone however, after a self assessment, you will probably be safest to crawl to a nearby seating surface that is steady. Work your way into the seat and consider a further self assessment in the seat prior to standing. At any point in this process, if injury is noted you should request a call for emergent medical assistance. If in the home alone, you are probably safest to crawl to the nearest available telephone to call for such help as standing could result in a second fall with increased injury. If you are alone when you fall and have to call for help, the key is to work your way to the telephone in the safest manner that will minimize further injury. 3. You have felt “clumsier” lately. You’ve knocked over various things while reaching for other things and you have fallen a few times this week. After reading these scenarios, which ones do you think should be reported? Scenario 1, seems fairly innocuous and probably requires some minor problem solving to prevent in the future. Reporting is probably not necessary. Scenario 2 conversely is severe and should have never made it to the first fall without being reported. Scenario 3 should probably be reported. Why are they different? This is the nature of falling in people. We fall at different times in life, at different quantities, and for different reasons. It is important to report falls when the cause seems to be innate rather than environmental. Such falls should be reported to a healthcare provider so that further evaluation can be performed to determine what corrective measures are required to maximize safety, mobility and quality of life. To whom should you report the fall to? The starting point is always your own physician. He/she typically knows your history and will do an evaluation to determine if further, more specialized care is needed. Falls are common in persons with amputation and falling injures many people. It is hoped that this article serves to stimulate thinking about details of falling; what causes it, how to prevent it, what to do to minimize trauma during the fall, what to do post-fall and when to report that you have fallen. A brief writing such as this cannot be all-inclusive. There is an entire scientific body of knowledge describing the falling phenomenon in persons by age, by medical diagnosis and more. Your best protection regarding falling is to know that it is common, take measures to prevent it and prepare for it as best you can. 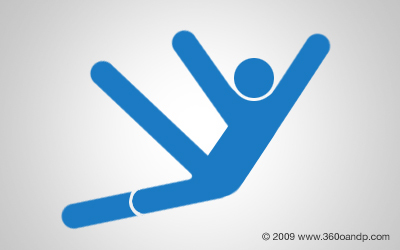 If you have further questions on falling, always contact your healthcare provider. M. Jason Highsmith is a Physical Therapist and board-certified Prosthetist. He is an Assistant Professor at the School of Physical Therapy & Rehabilitation Sciences at the University of South Florida. 360 O&P website content is to be used for informational purposes only. The information on this site is not medical advice. Users should always obtain medical advice from a medical professional, such as a physician. In the event of an emergency, call 911. 360 O&P does not recommend or endorse specific medical procedures, products, opinions, or products mentioned on this Site. Visitors relying on medical information on this Site should do so at their own risk.